On this rainy day, I have nothing to do but contemplate the female sexuality. I am trapped in a room with no kitchen and only Sleeping Beauty and Prince Tristan and a collection of lusty poems from my English class. Yet in the end, my thoughts return to food. the creamy texture of an avocado coating the tongue. 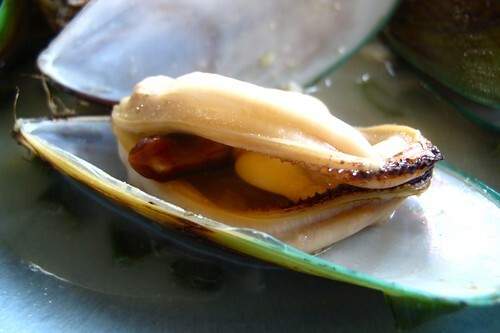 This deliciously inviting mussel resembles another muscle...no? I love green-lipped mussels. They're so much meatier and tastier than the smaller P.E.I. mussels. 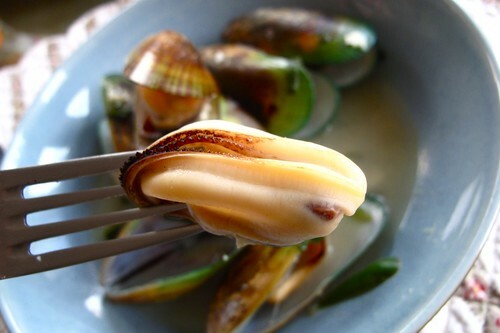 Every time I see them at Whole Foods, I buy every last green-lipped mussel they have. This is my favorite way of preparing them. The Thai-inspired broth is deliciously lemony and fresh with a spicy heat from the serrano pepper. 1. Cut the stalk of lemongrass into pieces, dice the shallot, zest and juice the lime, and cut ginger into large slices. Combine with fish stock, water, rice wine vinegar, salt, and sugar. Bring to boil and reduce by a third. 2. While the broth is reducing, clean and de-beard the mussels. 3. Strain the reduce broth through a sieve and reserve. 4. In a large pot, saute minced garlic, sliced serrano pepper, and grated ginger in the sesame oil. Add the mussels to the pot with some salt. Transfer some of the broth to the pot with the mussels. Add enough to cover the mussels only halfway. Cover and let the mussels cook until they open. 5. Plate in a shallow bowl along with some broth and enjoy with someone you love. 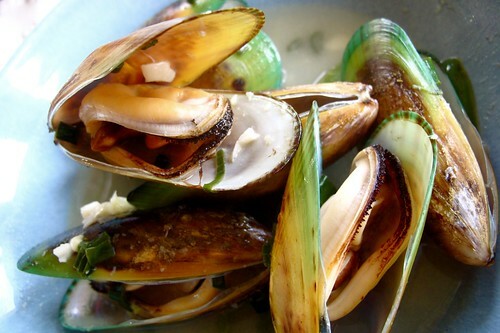 beautiful pictures of the green lipped mussels, wish I could use it in my upcoming cookbook, pics are better than mine! the recipe sounds lovely as well. De-Bearding is crucial. Such a risque shellfish! Gorgeous.